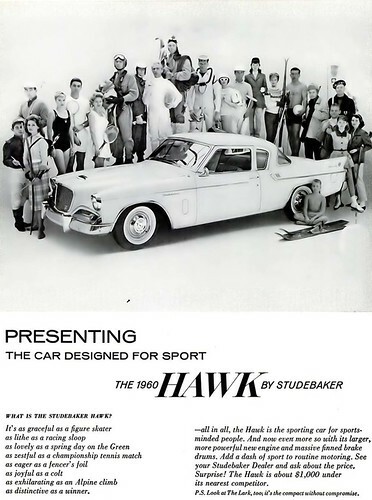 Hawk by Studebaker Advertisement - Ebony Magazine, May, 1960, a photo by vieilles_annonces on Flickr. In 1960, the Hawk was in its 4th year as a model, but its 9th year as a body style. Where the original 1956 family of Hawks (Golden, Silver, Power, Flight and Sky) had been pitched as a complete range of sporty family cars with a range of powertrain choices and hardtop or sedan styling, by 1960 there was only one Hawk, and the Corporation was hitting the "personal car" concept pretty hard in advertising. Here's an example of that pitch, from the May, 1960 issue of Ebony magazine.